Brisbane’s future RNA Showgrounds can expect a mixed use precinct with improved linkages, fresh food markets and other amenities. UPDATE HERE | This is an artist’s impression of what the RNA Showgrounds could look like after it undergoes an urban renewal process which will see a residential population of around 10,000 people and a predicted 8,000 strong workforce. 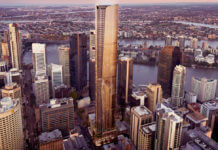 The Bowen Hills area is earmarked for large scale redevelopment as it is in close proximity to key activity centres as well as rail infrastructure. 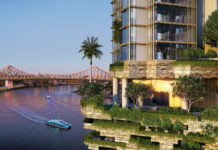 Lend Lease, which now holds the rights to develop Brisbane’s RNA showgrounds has released it’s new DA, pending approval by the Urban Land Development Authority (UDLA). 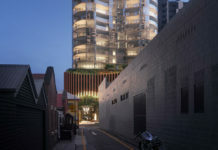 In the proposal, heritage and tradition have both been celebrated while plans for mixed use residential, retail and office precinct will breath new life into the area throughout the year. RNA Showground facilities within the centre of the Site. 5 stories in the central northern part of the Site. The level of density will protect the existing RNA/Ekka uses while more land will be used for public amenities including improved bikeway and walkway paths.